Ever since I finished the 2nd guest bedroom I have been organizing my closets. My latest victims are all of my throw pillows and pillow covers. Since our house is small, with limited closet space, I’ve had to strategically place items here and there to fit but having pillows all over was driving me crazy…I could never find what I wanted. So I decided to store them all together so I can get to them easier and see what I have. Putting them all together made me realize just how many I had but it was also nice to see some pillow covers that were long forgotten. The first thing I did was to get 1 small bin for covers and 3 large bins for pillows from Home Depot. I separated the pillows by size and used some painters tape to label each bin. These last few pictures are not my best, they were taken in the basement where there is no natural light. Then I went through the pillow covers and sorted them by color. I need to get a couple more small bins so I can sort them by size but this is ok for now. The bin is clear so it’s really easy to see what I have. I put a cedar block in each bin and a dryer sheet to keep everything smelling good. That’s it really. It took some time but it’s nice to have them all in one spot, in the basement, and doing this gave me some much need space in the bedroom closets. Not beautiful but definitely functional. What have you been organizing lately? Any tips you care to share? I resisted the idea of using bins for a while because they take up so much room, but now I’m glad I have all my pillows together and sorted. So much better. 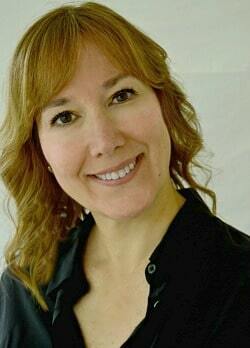 Thank you Katherine for hosting your fab party every week. Kristi, I do the same with seasonal pillows. I store them in large plastic tubs under the guest beds. I like to buy like size pillows when possible, so that I can use the pillow forms throughout the year and only store the covers. Unfortunately my goal and reality haven’t matched up all that much. 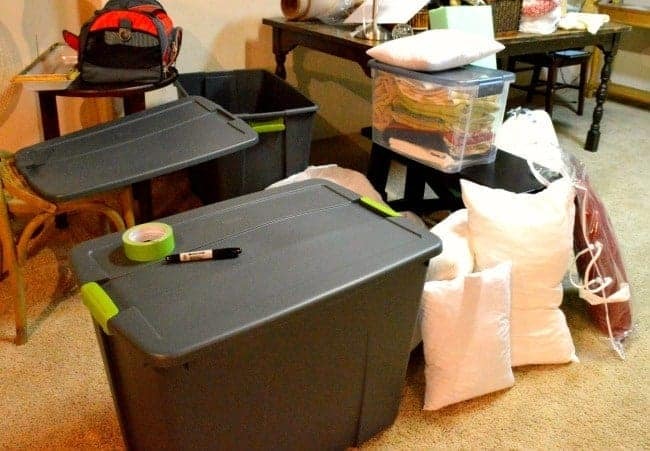 Pillow forms take up a lot of storage space! LOL, I totally understand Sarah. I tried to do that too but then I see a pillow cover that is the “perfect” colors and then I need a form to fit it. 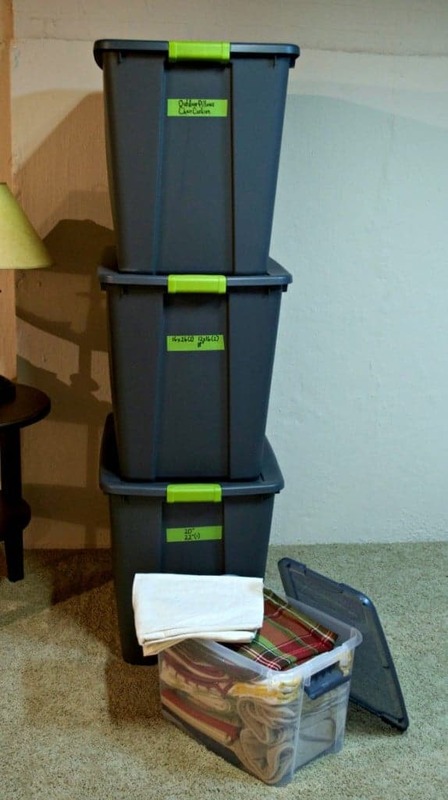 You are so right about storing them, there’s only 3 pillows in each bin…totally nuts! There’s something ridiculously satisfying about having everything folded neatly into a box. 🙂 Our current apartment is actually so tiny that we don’t even have any closets, but I’m definitely looking forward to the day we’ll be able to store stuff easier and rotate throw pillow covers! Haha, you are so right Giedre. The OCD in me is jumping for joy. It must be really tough to have no closets but it does force you to be super organized. I don’t know what I would do if we didn’t at least have the basement. Unfortunately it has allowed me to hoard things that I normally wouldn’t keep. Excellent idea for those pillow and covers! I just wish I had a basement. The garage is really my husband’s shop, well heated and spacious but packed full, heh. I am trying to organize the closet in Spare Oom. 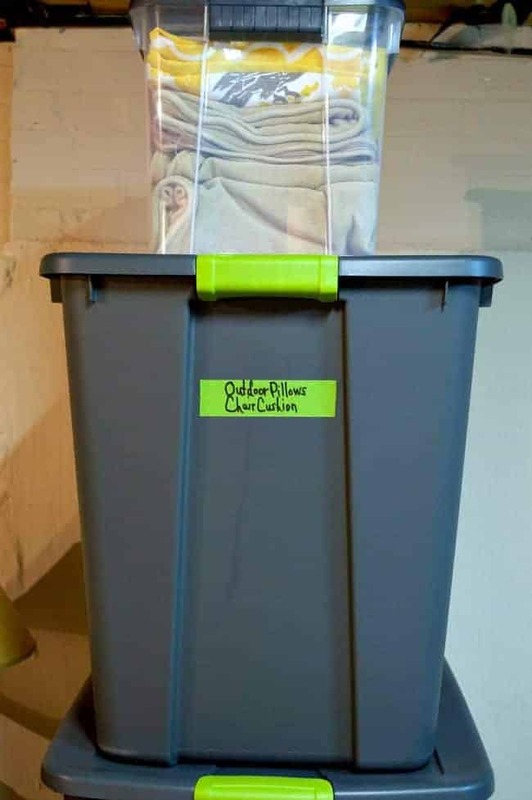 Clear bins are key. Need to pick up some more today, in fact. Your garage sounds just like ours, it’s my husband’s domain. I would be in big trouble if we didn’t have the basement. I’m starting to collect a lot of stuff though so I need to be careful. You are so right about the clear bins, they are key to good organization..
Hi Kristi I hope you made it home safely. I have a lot of pillows to store, I like your idea to use a bin, (mine are in plastic garbage bags) as it helps them to eep their shape. while not getting musty in the basement. As for covers, most of mine get destroyed so go in the give away pile and are not kept for the next year. I’m impressed that you can keep them from year to year. We did make it home safely but what a mess to come home too. 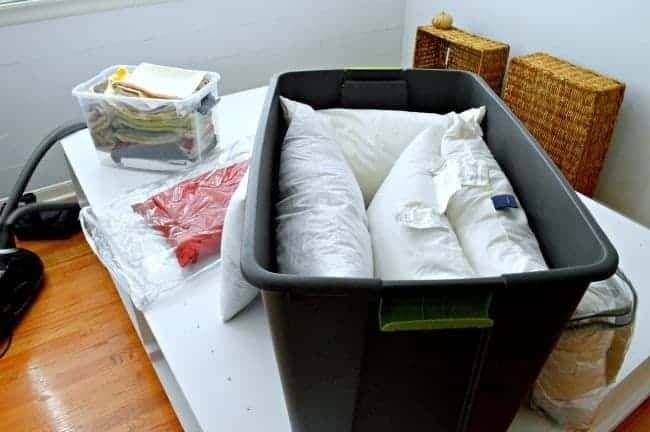 I have always kept my pillows in a garbage bag too, I was too cheap to buy bins, but now I’m glad that they are sorted and in bins. I am organizing my whole house/condo. I still haven’t organized from my move in August. I get frustrated because I do not know where to store things. I have no outside storage because the association does the lawn. I have a screened patio and a small closet in the entryway I keep my broom and Bissell sweeper, dog food and leashes. The two top shelves have drop cloth for painting and rags. I needed a place to store the few hand tools I own and paint brushes. There were some heavy duty S hooks hanging from the wire shelf in the laundry which gave me an Idea. I hung them on the coat bar in the entry closet, put all the paint brushes in a cloth grocery bag and the few tools in another, then hung on the hooks. Problem solved. Now all I have to do is grab and go to where I need to use them. Now if I could find a solution for my beach equipment I would be set. Sounds like some great storage solutions for your brushes and tools Deb. I thought my closet space was limited but it sounds like you have me beat. I’m sure you’ll find a solution for your beach equipment too. I would love to have that many pillows!! Okay, maybe only half as many, but certainly more than what we have now!! I think that’s a great way to organize, them, though! 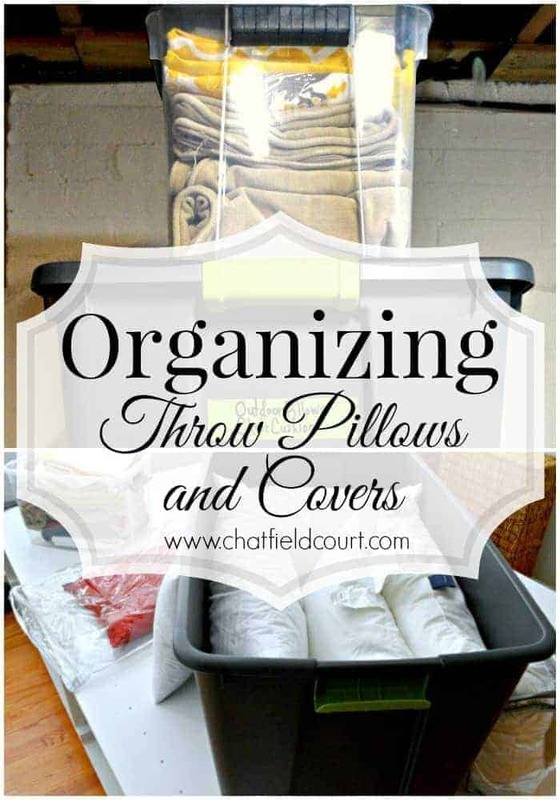 Especially when you can get the covers organized by size, that way it would take all of five minutes to get a pillow of a certain size and look ready to go!